I was sworn in as an attorney, for Michigan November 1, 2012. I can help you get through the divorce maze, filing paperwork if you need that done. 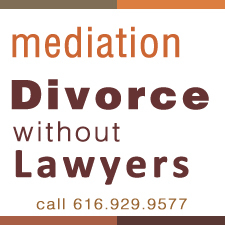 I still very much believe mediation is a better method, but too many of the clients have needed some help with the documents, so I am now a Michigan lawyer.